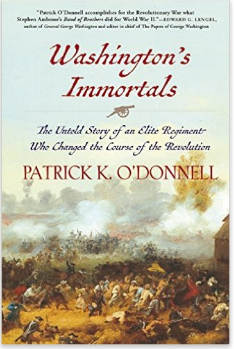 Military historian Patrick O’Donnell’s Washington’s Immortals: The Untold Story of an Elite Regiment Who Changed the Course of the Revolution tells the dramatic story of the First Maryland Regiment and the War for Independence. Known as Smallwood’s Battalion, the First Maryland Regiment was present at many of the major battles of the Revolutionary War, including the battles of Trenton, Princeton, Camden, Cowpens, Guilford Courthouse, and Yorktown. The following excerpt describes the formation of Smallwood’s Battalion in 1775 in response to the Second Continental Congress’ call for the establishment of a Continental Army.